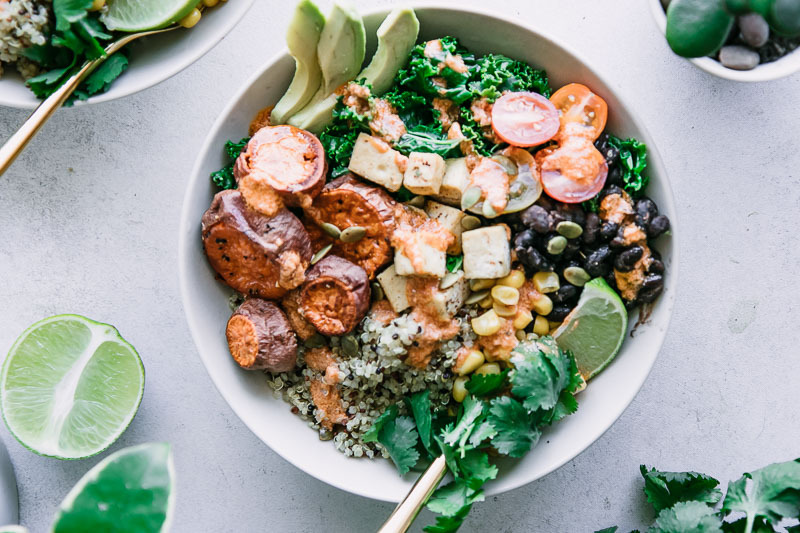 Chipotle Lime Black Bean Bowl, an easy Mexican-inspired vegan black bean and tofu grain bowl with quinoa, sweet potatoes, and corn with avocado and a drizzle of chipotle lime tahini sauce. Great for meal prep! Are you a bowl aficionado? We love to throw together simple vegetable-based bowls for easy lunches and dinners throughout the week. Our recipe for the perfect bowl includes a simple grain and a few seasonal vegetables, but what really takes a bowl to the next level is a flavorful sauce drizzled right on top. 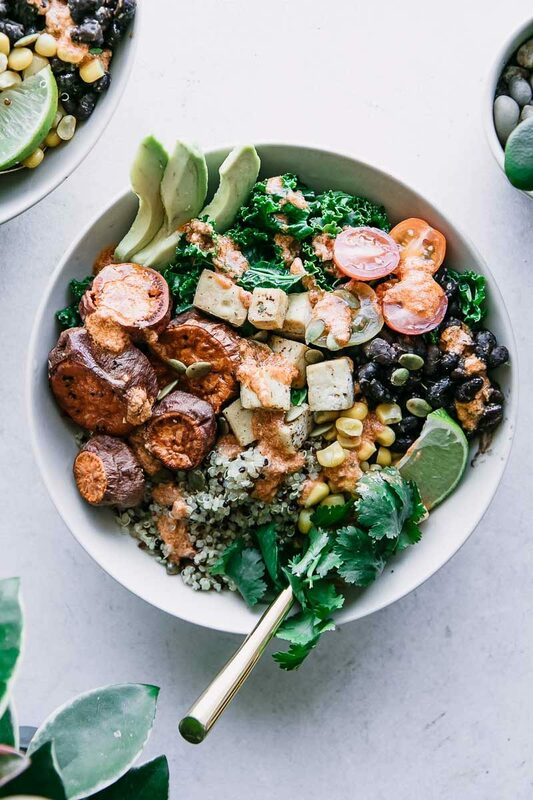 This Chipotle Lime Black Bean Bowl does exactly that with a Mexican-inspired chipotle lime tahini sauce, made from chipotle peppers in adobo sauce, lime juice, garlic, and tahini for a creamy texture. Drizzled on top of quinoa, black beans, sweet potato, and tofu, it’s packed with plant-based protein and tons of flavor. 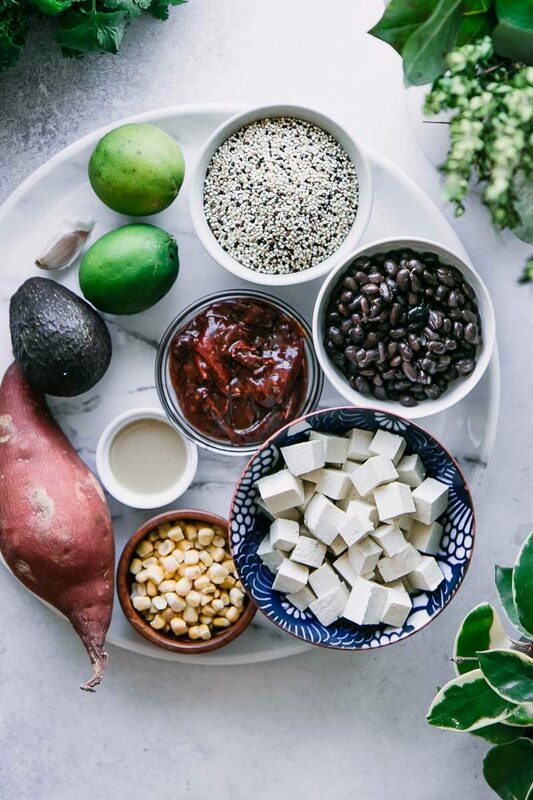 Ready to learn how to make this simple spicy black bean tofu bowl? Let’s do it! First, prep your bowl ingredients. Roast the sweet potatoes in the oven at 425 degrees until crispy; see the recipe for our favorite roasted sweet potatoes. While the potatoes are roasting, cook the quinoa according the to package instructions. Wilt the kale in a large pan with a bit of oil or water to soften it, but don’t cook completely. To cook the tofu: cut tofu into cubes and heat over medium-low heat for about 15 minutes, flipping often to brown all sides. To cook the tofu: cut tofu into cubes and heat over medium-low heat for about 15 minutes, flipping often to brown all sides. Next, cook the beans. Add the beans to a pan over medium heat and season with chili powder, garlic powder, and a bit of lime juice. Cook until soft, about 3-5 minutes, stirring often. Now it’s time to make the sauce. Add the olive oil, tahini, chipotle peppers, garlic, lime juice, and salt to a food processor or blender and pulse until smooth. Add a small amount of water bit by bit until you have a smooth, slightly thick sauce. Finally it’s time to build the bowl. 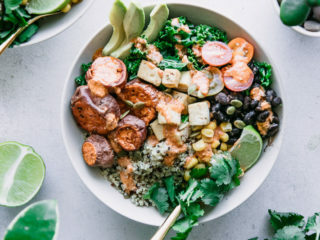 Add quinoa, black beans, tofu, sweet potatoes, corn, avocado, cilantro, and other toppings to the bowl and then drizzle with the chipotle lime tahini sauce. Enjoy! While this vegan black bean bowl with spicy sauce is super simple to make, there are a few tips and tricks for making it even easier — and tastier. Prep the ingredients ahead of time. Make the quinoa, sweet potatoes, black beans, tofu, and even the sauce ahead of time and build the bowl later. Get creative with bowl toppings. Use brown rice instead of quinoa, sub kidney for black beans, and add toppings like tortilla strips, salsa, and cotija cheese for an extra flavor punch. Freeze for later. This black bean bowl meal prep recipe is also freezer-friendly! Simply build your bowls, freeze for up to a month, and pull out for work lunches and busy weeknights. Love this simple plant-based bowl recipe? Check out our other seasonal bowl recipes, like this Harissa Black Bean Quinoa Bowl or our weekly favorite Ginger Soy Tofu Bowl. Did you make this Chipotle Lime Black Bean Bowl? Leave a comment below and rate the recipe to let us know how it turned out. 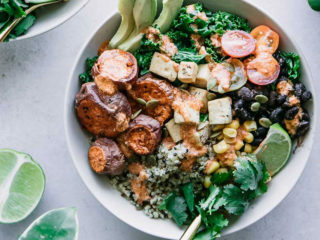 Save this vegan bowl recipe for later by pinning to your favorite bowl Pinterest board and make sure to tag me on Fork in the Road’s Instagram to show me your spicy bowl creations! Optional toppings: cilantro, avocado, tortilla strips, lime wedges, cotija cheese, etc. Prep ingredients: Roast sweet potatoes by sliced or dicing into cubes, tossing with olive oil, and roasting for 40 minutes at 425 degrees F, or 230 degrees C (see our favorite roasted sweet potato recipe here). Meanwhile, cook the quinoa according to package instructions and wilt kale in a large pan with a bit of oil and water for 3-5 minutes until the leaves soften. Crisp the tofu in a large pan over medium heat, cooking for about 15 minutes and flipping to brown all sides evenly. To cook the beans: add beans to a pan over medium heat and top with chili powder, garlic powder, and a squeeze of lime juice. Cook 3-5 minutes, or until black beans are warm and begin to soften. 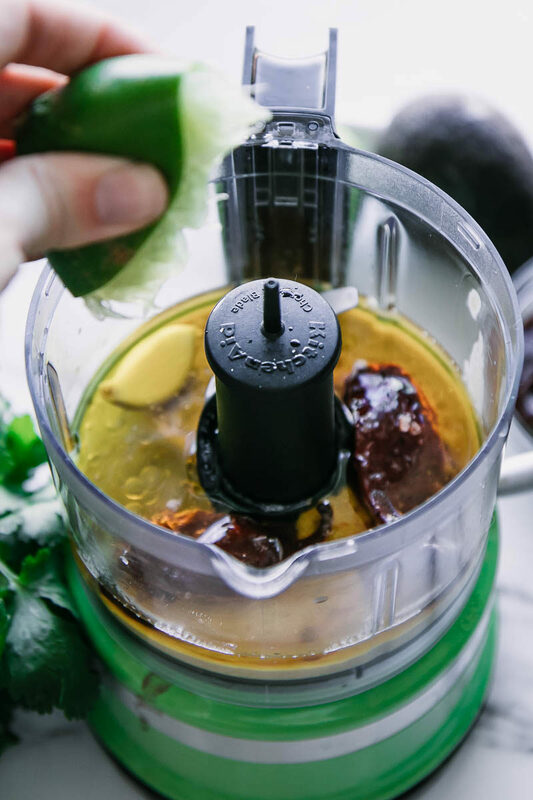 To make sauce: add olive oil, tahini, chipotle peppers, garlic, lime juice, and salt to a food processor or blender. Pulse until smooth, adding water until desired consistency. Set aside. To build bowl: add quinoa, black beans, tofu (if using), sweet potatoes, corn, avocado, and a handful of kale to bowl. Drizzle with chipotle lime tahini sauce and enjoy! Notes: this recipe requires a few items to prep before building the bowl: cooking the quinoa, roasting the sweet potatoes, and wilting the kale. Cook time is based on making sauce and building the bowl; total cook time starting from scratch is 45 minutes. Tools Needed: large sheet pan for roasting potatoes, environmentally-friendly cookware to make quinoa and wilt kale, and a food processor or traditional blender to make sauce. Prep Ahead: roast the potatoes, cook the quinoa, wilt the kale, and prepare the sauce ahead of time for easy bowl preparation. Leftovers and Storage: store leftover bowl in an airtight container in the refrigerator for up to five days; this is also a great meal prep bowl that can be frozen and reheated up to a month later. To reheat: to microwave, heat on high for 3 minutes, stirring halfway through; on stovetop, put bowl contents into a pan and heat over medium heat until warm throughout. Nutrition notes: nutrition information is for one bowl with one fourth the amount of sauce and topped with avocado and cilantro. This flavorful bowl is high in plant-based protein, high in fiber, low in sodium, and is a good source of vitamin A, iron, and potassium. I love a meal like that, in a bowl all arranged neatly. Quinoa, bean all thing good for your body and delicious, why not! Exactly! You can’t beat those delicious plant-based proteins and I of course tried to fit them all into one bowl. Thanks for stopping by!